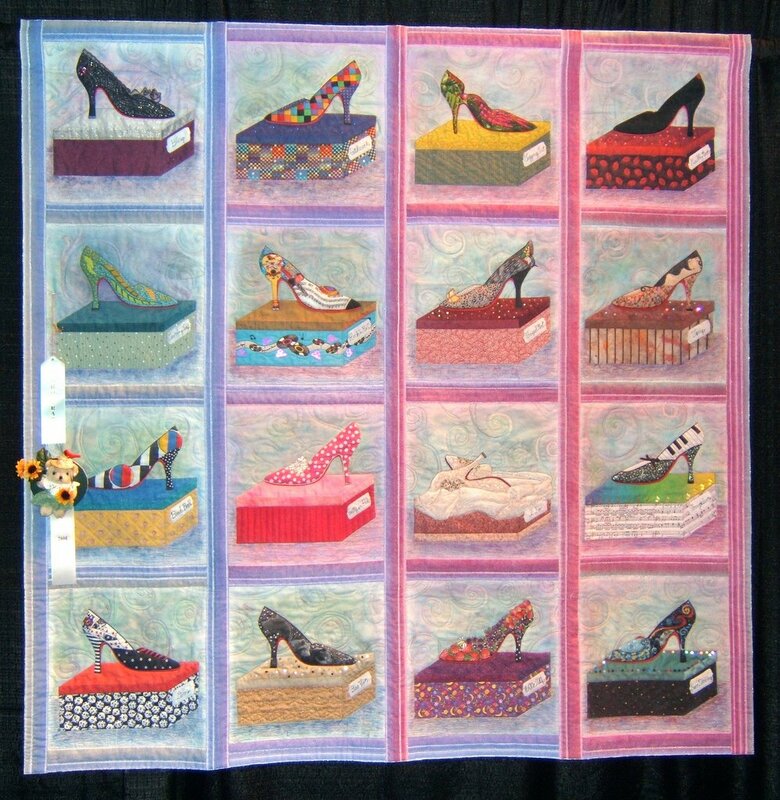 The Dogwood Arts Quilt Show is just about the only competition that I enter. It's a judged show with cash awards held here in Knoxville. It draws really good quilt entries from all over the country as well as many local ones. 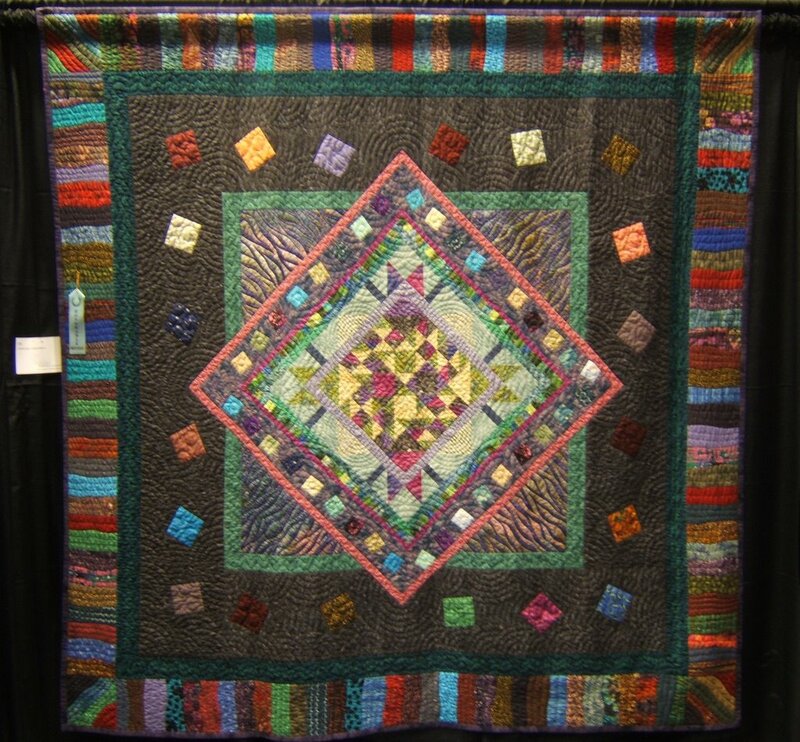 For me, this show serves as a way to share quilts beyond my circle of friends and family. It's also a personal measuring stick to see how my work stands ... that I've still got "it". Here are my three entries. Each shoe in its "lit" display cube is a translation of a heel designed by Christian Louboutin, a Parisian shoe designer. He paints all the soles of his shoes red. The glow of the lights is achieved with oil pastels. I had great fun designing and constructing the shoes two years ago. Last spring they got names and boxes. Giving them all a venue took just about every moment of studio time since I got back from Michigan. It's contructed with my collage technique of layering all the elements under tulle netting. The machine quilting holds everything in place. This may just be my last large machine quilted piece. It was a real struggle wrestling this much quilt through the sewing machine. I'm very pleased that "Imelda's Dream" also received the "Just For Fun" special award. I was inspired to make this tryptic when Lee and I hiked through an area that had burned ten years earlier in Jackson Hole, Wyoming. I had a strong emotional reaction to the tender new growth under the still standing burned trees. It was a glorious early summer day under a clear blue sky. There were flowers blooming everywhere among the new growth trees. I couldn't help but think of how perceived destruction is often necessary for regeneration. A prominent example being chemotherapy. I want to express my appreciation to Kate Cox who intoduced me to the technique I learned in her "Fabric Landscapes" workshop. It was pefect for expressing the feelings evoked that most memorable day. All kinds of squares joyously dance through this quilt. The design evolved through a "round robin" design exercise with my daughter-in-law, Jeanette Jancius Durand, and niece-in-law, Diane Cross Durand. We had each designed and made the center panel for a quilt. Then we swapped those and added to it. The challenge was to make the addition unique and to have it work with what was already there. At the end we each had a large piece that the three of us had contributed to. 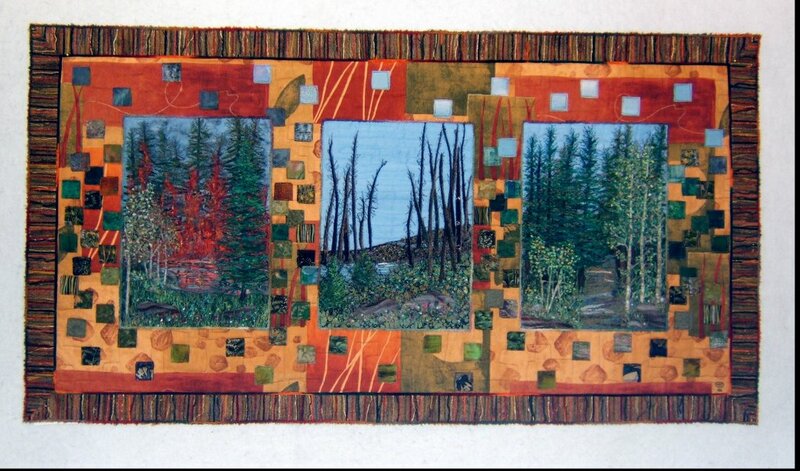 I continued adding onto mine to make this bedsized quilt. 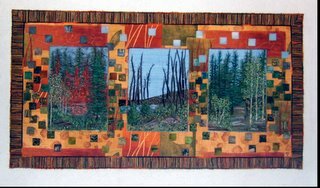 Thank you for visiting my show quilts. I hope that you clicked on each photo to enlarge it and then clicked again to see details. 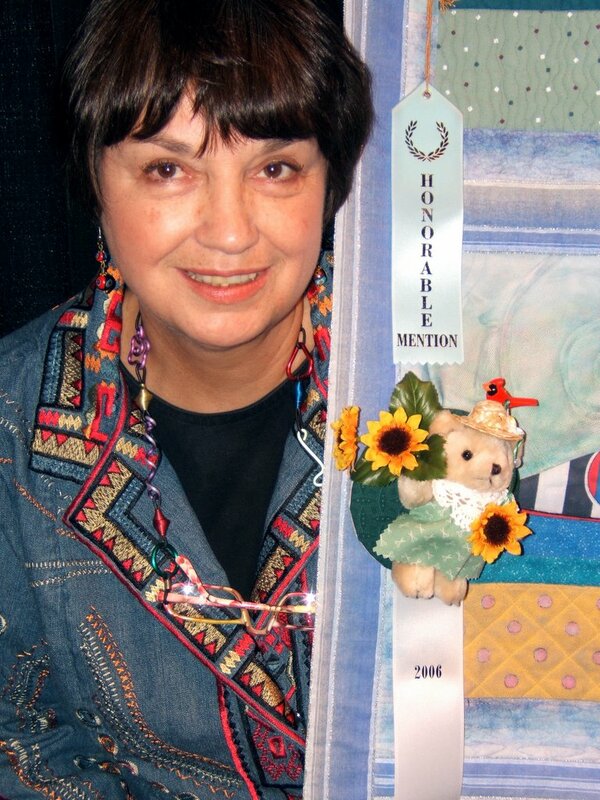 To view the rest of the winning quilts in the Dogwood Arts 2006 Quilt Show go the Smoky Mountain Quilt Guild website.